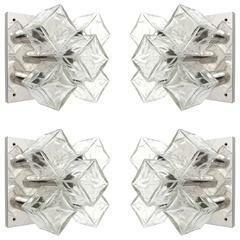 A set of three six-arm wall lamps or flush mount light fixtures model 'RS 6 WA' by J.T. Kalmar, Austria, manufactured in midcentury in 1970s. 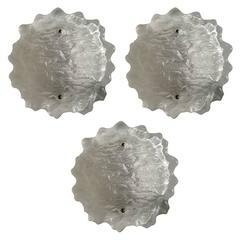 Each light is made of polished aluminum and 6 handblown bubble glass lamp shades with a diameter of 4.7 inch (12 cm) per shade. 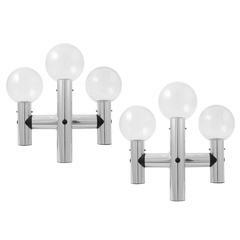 Each fixture takes six E14 candelabra screw base 40W maximum bulbs or LEDs. They can by mounted in many different ways: with horizontally or vertically oriented arms and on walls or ceilings. The lights are documented in the Kalmar catalogue from 1973. The price is per fixture. 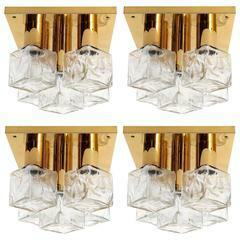 They will be sold individually, as pair or as set of three lamps. Shipping price depends on number of ordered items. 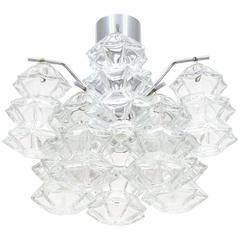 Matching other Kalmar lights (pendants lights, sputnik and atomic chandeliers, sconces) from the RS series are available (see last images).